I am both an introvert and starting a church, which is not the easiest combination. People find out what I do and they have questions to discuss. Not simple questions, but serious, complex questions about God, life, church, death, and life-after-death, just to name a few. I love to have these conversations, but admittedly there are times when I don’t feel up for it. Recently we were out for the evening, dinner with friends and then to a bar to see a band perform. While waiting for the band to take the stage, I was introduced to someone as, “This is Jennifer. She is starting ‘The Other Church’ along with her friend, Erik.” I was asked what The Other Church is, where we meet, the usual questions. After I talked a bit about what I am doing and why, he asked, “So what do you think of the bible?” Based on the sudden intensity in his voice and body language, I suspect that I had ventured out of his comfort zone and was now being tested to determine how much of a heretic I might be. Okay, maybe I’m overstating it a little. But seriously, he wanted an answer to a big question, and I just wanted to go into the other room where the band would soon be playing. Sometimes the questions are like this guy’s, a little accusatory or at least awkward. Often people are interested in the opportunity to explore something. Conversation tends to delve quickly into deep waters and I admire the bravery I see as people share deeply personal thoughts. However I have occasions where I want to say, “I had a really long day and don’t feel up for this conversation right now. Could we talk another time?” But I don’t. I listen and I answer and I ask questions in return. This is not the conversation I wanted to have. I think the guy was a bit antagonistic, but I think he was also sincere in the attempt to navigate his discomfort. I should have listened and asked questions. Instead I got defensive and articulated my view in a way that didn’t further conversation but rather shut conversation down. I forgot that he and I have more in common in our love of the bible than where we differ in terms of its content. I forgot that I am not an expert, just an explorer. I could have been kinder. I should have been more thoughtful. But I was tired and wanted to stop talking. Perhaps what I should have done was focus on the commonality – two people in search of a God worth following. And perhaps I should have been honest about my limitations in such a serious conversation. I would have thought that being in a bar at 10:00 pm on a Friday would alert him of my possible limitations, but in reality this happens to me in all kinds of places and at all times of day. And perhaps most of all, I should have said upon introduction, “I would love to have this conversation of what I am doing and why, but let’s do it another time.” Not my best moment, but I hope to do better next time. My daughter has always had an air of caution about her. It’s not that she is fearful or doesn’t take risks. In fact I would say Liv is quite adventurous. But she tends to think through what she’s doing. Once she has deemed something worthwhile, she goes for it. Now that she’s 14, this is a great trait. But the early years were a little problematic. She would come up with something she thought was quite logical, but her logic had limitations and she would occasionally get stuck. For example, one day in first grade she went to the nurse’s office because she wasn’t feeling well. She threw up on the nurse, the floor, and herself. The nurse was annoyed that Liv didn’t use a trash can (Really???) and Liv was mortified. Liv wanted to make sure she would never experience this kind of embarrassment again, so she (in her mind) logically concluded that she should never throw up again. Bedtime ritual typically included talking about the day, a bedtime prayer, kisses and hugs. Then one day, shortly after the throw-up incident in the nurse’s office, she asked, “Will I throw up?” “No,” I said. “Promise?” I tried to reason with her and tell her that I couldn’t make that promise. But she needed reassurance and it was more important to do that than worry about breaking a promise. And so each night for a few years to follow we would go through the routine, “Will I throw up?” “No.” “Promise?” “Promise.” I assume that her logic was that we as parents were trustworthy, and our promises assuaged her fears. Other promises followed. And it was always for a sense of peace. She never asked us to promise her a pony or a trip to a faraway land. Her requests were always her attempt to be reassured, comforted, and told it would be okay. I remember my son periodically asking me if I would die. When he was young I would simply answer with a “no” and that was that. When he got older, I answered with a little more vagueness, “I have plans to be around for a long time.” The answers satisfied him and eventually he realized that I couldn’t know when I would die and so he stopped mentioning it. My daughter, on the other hand, didn’t stop. She would hear, read, or think of something related to my dying, and then come to me asking me to promise that I would never leave her. When she was about 10 or 11, I became increasingly uncomfortable with the exchange. It’s not that I didn’t want to comfort her, but I knew that her logic had exceeded this ritual. And so the day came where she said, “Mom, promise me you’ll never die.” I hesitated. I looked at her pleading face. Tears began to well in her eyes. She was old enough to know that this was not a promise I could make. And yet I could see the little girl in her looking for reassurance. She said again, “Promise me, Mom.” And I thought, “What if the unthinkable happens? Will she look back at this moment and hate me for lying if I make her this promise now?” She tried to blink back the tears. She probably knew what was coming. I hated to say it, but I had to. “You know I can’t make that promise.” Tears spilled onto her cheeks and it was painful to watch. She knew what I was saying was right, but it was hard to hear. And then I knew what I had to do. I hugged her tightly and said, “I promise to do everything I can to be around for a very long time. But I want you to know that whatever happens, I know you’ll be okay. No matter how hard life gets, you are strong and kind and loving and resourceful. You will find what you need to get through. You have so many people who love you and will be there for you. YOU are going to be okay.” And I held her while we both cried a little. It wasn’t that I could no longer reassure her, but I realized her reassurance needed to be different. She was old enough to face what was real, and needed my help in finding the courage to do so. I think we all have promises of our own that we ask, whether acknowledged or not, and we are hoping they will be kept. It doesn’t matter if they are realistic promises. They are rooted in both deep need and fear. “Promise me you won’t leave me because I can’t be alone.” “Promise me you really do love me because I’m not sure that I’m worthy.” “Promise me that you won’t tell me bad news because I don’t think I can handle it.” But there comes a day, or two or a hundred, when we are given an opportunity or even forced to face the need and fear behind the promise, just as my daughter had to do. 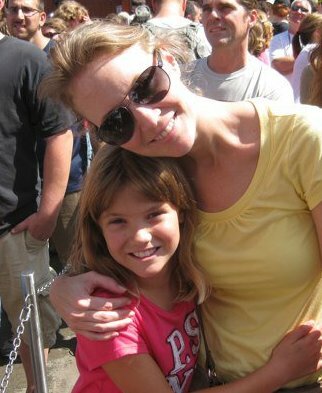 When she was little, Liv had the luxury of believing that her world was in my care. And I’m thankful for that because many children do not have that luxury. But at some point, that belief would have become detrimental to her. We can inadvertently teach our children and hope for ourselves that our world is controllable, that good things always happen to good people, that life is fair. But those things simply aren’t true. And when we assume God is only in the positive outcome or we have a faith that requires winning/healing/success/promise, we are denied the opportunity to experience God when we need God most, such as in a tight, long-lasting hug that follows a difficult truth. If you’ve read my previous posts about “The Perfect Dog” you’ll know that my desire for the perfect canine companion goes way back. Lately I’ve been thinking a lot about what a dog could offer in friendship that I have always longed for and/or enjoyed. Anyone who has ever owned a dog knows that there is no such thing as a perfect dog in the literal sense. Each dog has its annoyances, its imperfections. But what is it, sometimes in spite of that dog, that does so much for one’s soul? She’s uncomplicated. I don’t need to understand her past. I don’t need to anticipate her future. She needs to be fed, played with, walked, and given affection. When she receives those things, she’s content. She’s a great listener. She never interrupts or tells me to hurry up. She’s always up for whatever I suggest, whether it’s a nap in the early afternoon, a ride in the car, or playtime at 10pm. When I ask, she always says yes. She makes me feel special. When I return home I’m always greeted with tail-wagging. It doesn’t matter if I was gone for a few minutes or several days. She’s excited when I return and she lets me know. In this list, I see not only what I long for, but what I often fail to give to others. I’m complicated, sometimes excruciatingly so. I am not always a great listener. I rarely hear a suggestion without offering at least a slight amendment. I never wag my tail. My perfect dog has been perfect because she’s made me feel loved, needed, and special. She’s been a faithful companion in the good times and the not-so-good times. When I skimp on a walk because it’s too cold, she doesn’t hold a grudge. When I cut playtime short because I’d rather put my feet up, she doesn’t punish me. She enjoys what she’s given. She gives back without condition. Lucy is well over 13 now. We have had so many wonderful adventures over the years. She has gone with us to the beach and the woods and the wide open fields, romping and chasing and playing all the way. She has never refused an invitation to climb under the bedcovers for a nap or full night’s sleep. She has protected us from countless squirrels and cats that have dared to step into her yard. She has run more miles than most, an eager companion to Jeremy and me over the years, although admittedly far more of those miles were Jeremy’s. She has rescued us from ocean waves she thought were dangerous and UPS workers she thought were sinister. She has given our family countless memories. While my children have nearly grown up, Lucy has grown old. She has a heart murmur that causes her to cough deeply. She periodically has a leg collapse which often results with a faceplant to the ground. Why can’t dog years be the same as people years? For the time we used to spend playing, I find myself petting her and thanking her for loving my family so well. She’s now got several lumps, “fat pads” the vet said, apparently common in aging labradors. The lumps used to gross me out, but now that it’s almost unavoidable to touch one, I pet those too. She looks at me with longing eyes, almost confused by what she’s done to warrant the affection. Because animals are easily cared for and unconditional in their love, one has a choice whether or not to do the bare minimum. I could have met Lucy’s basic needs and left it at that. But I wanted to do more for her. And I guess that’s one of my biggest lessons from this perfect dog. Just because one can get away with the bare minimum, doesn’t mean one should. I have also learned how important silence can be to another human being. I see the value in trying to put into words or actions what I feel, rather than assume my feelings are understood. It’s not that my humans lacked these traits, but a dog offers them without expectation of something in return. I don’t know any human, myself included, who doesn’t get in the way of a relationship from time to time. Dogs are different. As I watch Lucy age, as I awaken more frequently to her coughing, as I see her struggle to sit her long legs down or get them back up, I find myself saying “not yet, don’t go.” Letting go of what has become part of you is so hard. Because she has been part of our family for so long and is integral to who we are, it is nearly impossible to imagine “us” without “her”. And yet, life has been showing me for awhile what that will look like. We are reluctant to bring her along on our adventures, knowing she doesn’t have the stamina she used to. We are making memories without her. We are saying goodbye in little ways. But we are also a different family because of her, and so even when she’s not physically present, she’s still with us. I will give Lucy all that I can give, including letting her go when it’s time to say goodbye. It would be easy to ask more of her than I should by extending her life longer than she might want. But I won’t. I love that dog, knowing she deserves to live and die with dignity. I will be with her to the end. And until that last day comes, we will love her and play with her and pet her and tell her over and over how wonderful she is, giving her all the joy we can give just as she has done for us. Thank you, Perfect Dog, for being my perfect dog. Your human is so grateful to you and for you. Wag, wag. This post was supposed to be the conclusion to my “Best Dog Ever” series. I have most of it written, but something was missing. I considered stretching it out a bit to make it work, but Lucy deserves more. And I know there is more of that story to tell, but my brain feels like it’s working on fumes. I then considered pulling something out that I’d already written, and just tweak it a little. But I remembered a conversation with a pastor from a few years ago. He said that whenever he has a sermon to give but runs out of time to prepare, he goes to his file of previous sermons and pulls something out. “Always there when I need it.” Somehow this filing cabinet perusal to replace time, effort, thought, and preparation seemed to cheapen the whole experience. In reality it’s not a bad idea. When you have worked hard on something in the past, why wouldn’t it also have potential future relevance? I was probably just being a snob. But today, I procrastinated in finishing up this post and now face a looming deadline. The reality is I didn’t put the time into this when I should have, and now that I need to pull it all together I am struggling to do so. I began this blog for two reasons: to build a body of work that articulates some of my personal journey, and to practice the exercise of writing regularly. Pulling something off the proverbial shelf could have accomplished my first goal, but it would have denied my second goal. I have spent the last few hours going between previously written essays and staring at a blank page. The blank page has proven to be the most daunting, the one I find myself most wanting to avoid. How do I fill this stupid page? What should I say? Do I have anything worth saying? At what point are my words forced and inauthentic? And yet as I tried to work and rework previously written words, it just wasn’t coming together. In my fatigued state, it finally occurred to me that maybe an opportunity was staring me in the face. Rather than exit quietly and replace what I’m trying to do with something previously written, I have decided to trudge ahead, explore my surroundings in spite of how difficult it is, and see what comes as a result. This is all beginning to sound a lot like my journal as of late. Over the last several years, I found prayer increasingly problematic. I have wrestled with questions such as why do we pray? What happens when we pray? Do we strive to get God’s attention or change God’s mind? Is it simply one’s own exploration of thoughts, dreams, fears? Phrases I previously used regularly began to sound increasingly hollow or trite or self-centered. If my healing means I am blessed by God, what does another person’s lack of healing mean? If my family’s good fortune means God is with me, what about that family that is falling apart? This kind of theology has contributed to poor behavior on the part of God’s “faithful” while alienating others who assumed they weren’t good enough for God. So as I wrestled with why or what or how to pray, prayer for me became either an exercise of silence, or words that someone else had written. Stare at the blank page in my journal for awhile. Write “Dear God” then stare at the page with those two words for awhile. Avoid adding the words “Are you there God? It’s me, Margaret” because that joke isn’t very original and I’m funnier than that. Stop thinking and just write. For now it’s just a few sentences that are honest and raw. Or it’s a question that I have. Or it’s something silly because that’s the only offering I’ve got to give. But it’s still taking a risk and I think that the effort is the point. As I finish this up, perhaps the same could be said for my writing today. My fear of the blank page isn’t so much about whether or not I can fill it because I’ve chosen to do so in spite of myself. My fear is more subtle and complex. I’m taking a risk by putting words to where I really am. But I have an opportunity to learn something and do better next time. There is freedom in acknowledging what is true, and interestingly enough I find myself not quite as tired as I was several hours ago. I find my mind a little more engaged. I will try not to procrastinate next time, and I am grateful that it’s okay that I did so this time.